Over the last few years, Eco Fashion Week has become a highlight of my annual fashion calendar. Back in the day, before I'd ever been to Eco Fashion Week, I had already discovered the joys of thrifting. It was an easy way for me to keep up with my fashion obsession without breaking the bank as a student. But it wasn't until I attended Eco Fashion Week that I really started to understand the environmental benefits of thrift shopping versus shopping new. It certainly made my shopping even more guilt free! I've also come to love Eco Fashion Week, as it not only inspires me to shop eco-friendly, but it's bringing awareness to a larger audience about the benefits of eco-fashion and thrifting. Today, I wanted to share with you Eco Fashion Week's Chic Sheets Challenge. It's one of my favourite shows, and features some incredible designs from local talent. The show challenges fashion students from LaSalle College in Vancouver to design creative fashion pieces from old sheets provided by the Fairmont Waterfront Hotel. The concept is meant to show how beautiful clothing can be created by upcycling - something we should all consider doing more of, even on a small scale. To celebrate Canada's 150th birthday this year, the theme of this year's Chic Sheets Challenge was "What does Canada mean to you?" Which one of the below designs is your favourite? Personally, I fell in love with the floor length blue gown by Christina Granneman, but they all had unique features that made them beautiful pieces of fashion art. I first saw the back of the blue dress, which incorporated 3-D scale-like detailing all the way up the back in a silhouette form that really accentuated the curves. Then I saw the front and fell in love with it even more! The neckline was stunning and very well structured. Ana Lisboa - Inspired by the untitled painting of Canadian artist Lawren Harris, founding member of the Group of Seven. According to the Hammer Museum, Harris "...scenes of a cold and empty northland, isolated peaks, and expanses of dark water beyond barren shorelines remain for many Canadians and non-Canadians the essential images of the country." Christa Granneman - Inspired by her hometown Port Alberni, the salmon capital of the world, and its importance to the indigenous people of the west coast. Hailey Yoon - Inspired by Canada's multicultural diversity. 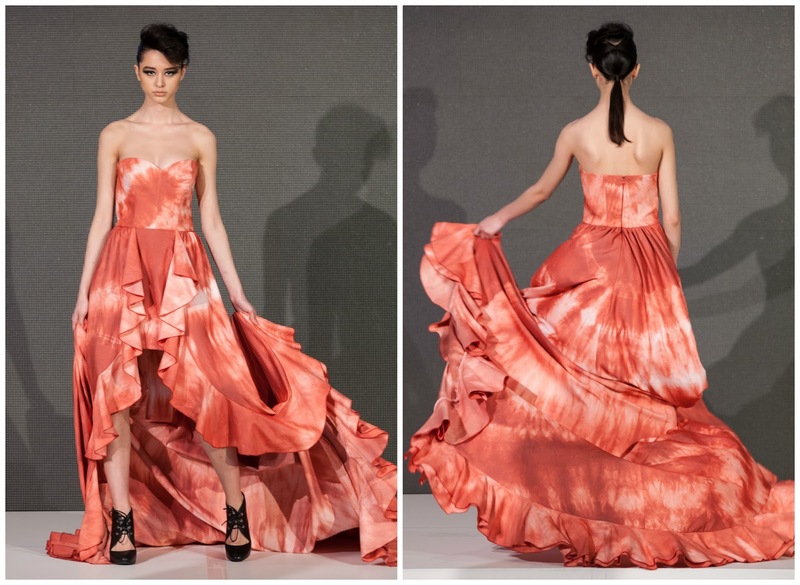 Each pleat with different colours represents the diverse cultures in Canada. 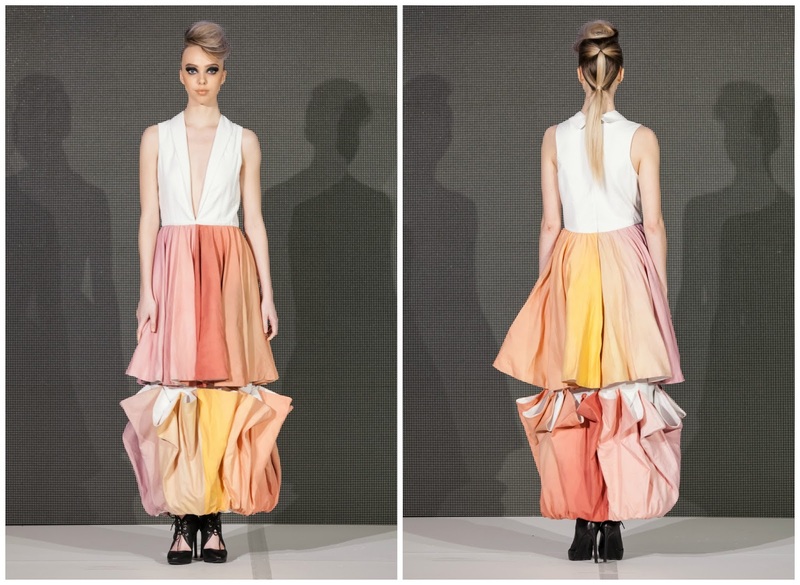 When the model walks, these pleats are uniform, showing how these different ethnicities are able to live together in harmony. 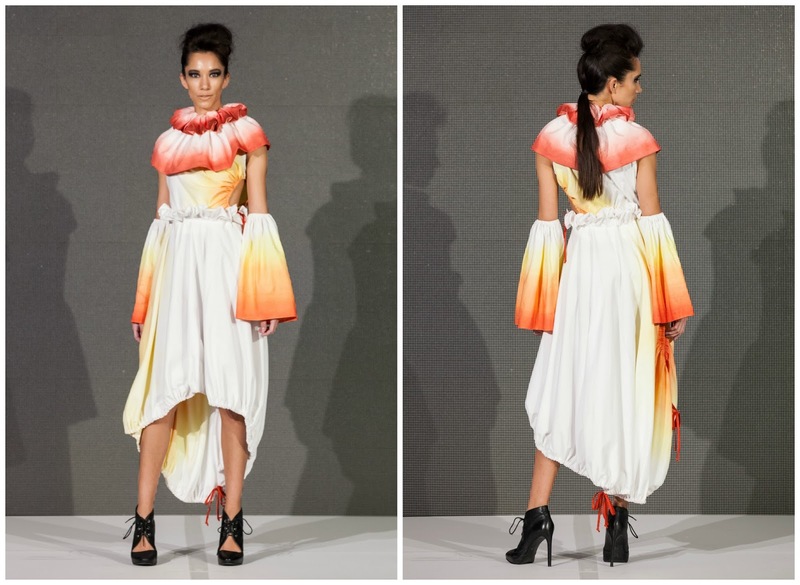 Jaspreet Kaur - Inspired by the mountains and natural landscape of Canada. The look reflects her personal style: feminine, casual and simple. 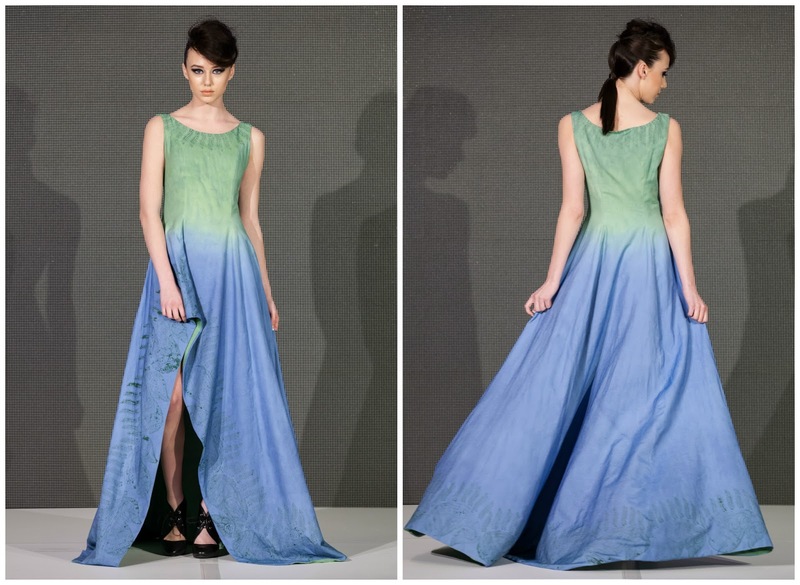 Jinju Ha (winner of the $1000 prize, chosen by a panel of eco-fashion industry experts) - Inspired by the northern lights. Only a few countries in the world are privileged enough to view the aurora borealis. The dress shows the beauty of Canada's northern lights, and conveys how we need to protect this beautiful environment. Rodica Goreea - Inspired by the history of the First Nations and the book "The Last of the Mohicans". Mohicans were a tribe that lived in lower Canada. They were honest and decent but defenseless. The dress is a Goddess, Uncas, who is the interpretation of the nature, mountains (the silhouette of the dress) and the indigenous (the colours of the dress). She protects the history and reminds us to care about the environment in order to have a future. Ryan Li - Inspired by the midribs of the maple leaves that branch into veins, and the veins continue to brand into small netted veins. It reminds Ryan of how Canada is made up of people from all over the world, and how it is essential for the citizens to be united, peaceful and tolerant of people from different races: exactly what the maple leaf represents as a recognized symbol of Canada. Yan Tong - Inspired by the diversity of Canada's population, this dress combines elements of Asian culture with details from European fashion history: namely the ruff. The ties that surround the circles symbolize how Canada connects all the different cultures together in harmony. This is further reflected with the colours of Canada's flag. Love your outfit. You're wearing one of my favorite colour combinations. Thank you for featuring Eco Fashion Week. You have the only blog that covers this worthy event. As a sewer, I find the fashion creations very inspirational! I'm wondering....did they dye the sheets? Or did they work with the colour of bed linens that they were given? Aw thank you for the kind words! I'm so glad you enjoyed the Eco Fashion Week coverage, it's one of my favourite events in Vancouver. The student designers used Tintex dyes to transform the white sheets! Awesome to hear they're inspiring fellow sewers.